On Saturday, Augustana celebrated the accomplishments of 421 men and women from throughout the U.S. and around the world at the 2017 Commencement ceremony, held at the Sioux Falls Arena. With family, friends and treasured professors cheering them on, tomorrow's nurses, teachers, journalists, doctors, entrepreneurs, artists, lawyers, scientists, pastors and community leaders walked across the stage, accepted their college diplomas, and officially began the next chapter in their lives. They are the Augustana University Class of 2017 — and they are simply extraordinary. Retiring President Rob Oliver served as the ceremony's Commencement Speaker. His remarks reminded graduates that life isn't necessarily about where they're going. Rather, it's about what they're looking for. To that end, Oliver shared a list of suggestions for what to look for in life. A good beginning. "Pursue experiences," Oliver said. "Allow your experiences to transform you. And discover your purpose from your experiences." Look for your own path. Follow your path, not someone else's, Oliver told graduates. "And let your head be a soldier for your heart. Your life is like a great adventure novel — don't forget who the author is." Look for ways to keep learning. "Be a student of whatever enterprise you get into," he encouraged. "Find ways to keep learning." Look for ways to save. "Live beneath your means. Spend less than you earn and always be putting something away," he said. Look for balance in your life. "Be sure that your 'work-self' has an off switch," Oliver said. "And remember that what you do for a living is not all of you." Look for joy. "Life is short. Be sure not to waste it," he said. "And remember not to take yourself too seriously. Perhaps angels can fly because they take themselves lightly." Look for when it may be your time to leave. Citing management guru Peter Drucker, Oliver said, "if you find yourself in a job where you're not learning and growing; not having fun, then make that happen outside of work and begin the process of preparing yourself for change. If your organization is not investing in your personal and professional growth, then you should. It is a matter of mastering your own destiny, not letting others be your master." Look to do what is right. "Don't let yourself be seduced to do something you shouldn't, simply to gain entry to the inner ring," he said. Look for ways to take care of yourself. "Pay attention to what goes into your body. By that I mean your mouth, your nose, your eyes and your ears — and most especially, your brain," Oliver said. "Read. Read. Read some more. It's good for your intellect and good for your vocabulary. Reading is good for your soul." Look for love. "Don't be afraid to fall in love," he said. "Love God. Love yourself. Love your neighbors. Love those around you. Life is meant to be lived in the company of others, so enjoy them and seek out the goodness in everyone. They say we fall in love with those who bring out the best parts of ourselves; the parts we ourselves would like to see more of. By building loving, caring relationships with others, you are also building the parts of yourself that you want to see more of." In recognition of Oliver's 25 years of service to AU, the Augustana faculty presented a resolution awarding him an honorary Doctor of Humane Letters, honoris causa. Watch a replay of the Commencement 2017 webstream. 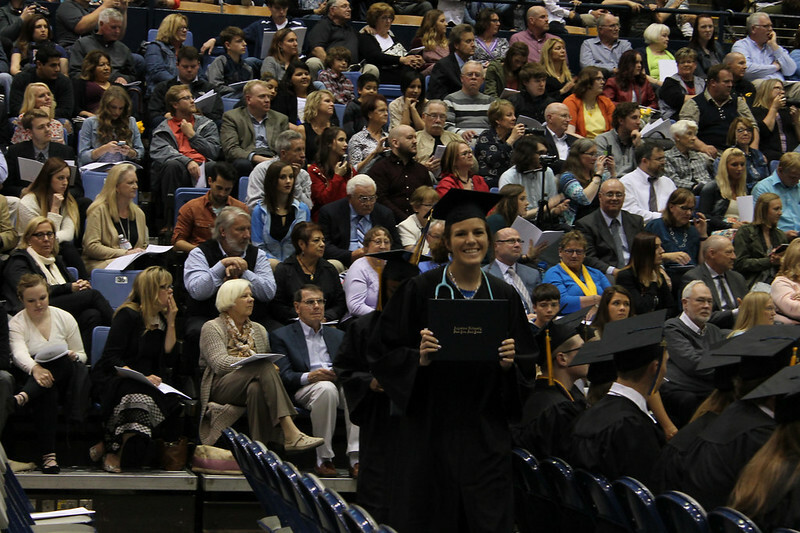 Katie Romano, a biology major from Cañon City, Colorado, served as the ceremony's Senior Speaker. Her remarks, “Finding Fluency,” encouraged her classmates to “use the fluency they’ve developed at Augustana to bridge divides, build community and teach others." She spoke before 362 graduates participating in the ceremony. Another 129 graduated in abstentia. "Class of 2017, we are not merely a collection of fancy words and good looks," Romano said. "We are fluent in cultures and core values — subjects ranging from nursing to physics, classics to performance art. We are fluent in global citizenship. Our specializations criss-cross and overlap in amazing ways to contribute to our fluency in the liberal arts. "It is of utmost importance that we continue to put ourselves out there. To dare to make mistakes in order to one day look back and see ourselves as fluent."